"The Shopping Center That Spawned a Community," by Peg Meier. In Mpls. St. Paul, vol. 9, no. 8 (Aug. 1981), pp. 66-69, 130-131. Mall Maker: Victor Gruen, Architect of an American Dream, by M. Jeffrey Hardwick. Victor Gruen Associates, Architecture, Planning, Engineering. Includes a brief history of the company, short biographies of major associates, brief information on other associates, a list of major awards and a representative list of clients, and photographs of the firm's significant projects, including Southdale Shopping Center (pages 26-27). Los Angeles: The Associates, 1966. Development plans for the Southdale Shopping Center in the city of Edina, including site plans and profiles, site details, utilities, building plans and profiles, a street improvement plan, a master plan for realty development in the Southdale area, and site plan for a proposed medical center. Victor Gruen was the architect. Note: According to the City Planning Department, these are not the as-built plans, but are very similar to the as-builts. MNHS call number: See the finding aid in the library (Hennepin County, Edina). Southdale Shopping Center, located in Edina, Minnesota, was the first totally enclosed shopping center in the nation. In 1952, its developers, the Dayton family, long-established Minneapolis department store merchants, commissioned the architecture firm Victor Gruen & Associates to create a new form designed to reflect and serve changing patterns of suburban living. The master plan combined elements of the village green of European city centers, with elegant arcades and gallerias, in a constantly temperature-controlled enclosure. 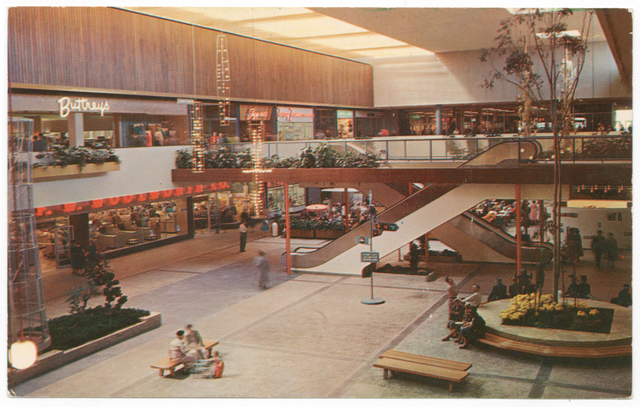 When Southdale opened in 1956, it included 72 stores and was anchored by two major department stores, all arranged in a two-level design around a brightly lighted center court. It offered free parking, and its 5000 parking spaces were grouped into lots, well marked by clever symbols to aid in locating one's own car in the sea of automobiles. Not only did Southdale Shopping Center fulfill the vision of its creators as a center of commerce and of social life for suburban residents, it also fueled suburban growth and became a much-imitated model.